Let’s face it ! Choosing the right marine battery for your boat or pontoon is overwhelming and tiring process. It’s not the easy pick for choosing anyone but getting the best of all the good options available. With different grades of marine batteries intended for specific use; it can easily let one’s head bobbing over choices. If you can’t get to a conclusion especially with more than thousands brands and options online; i have got you covered. Actually it’s not that simple when you aren’t sure what your battery is gonna used for. There are three main types of marine batteries used on boats and pontoon; the cranking type, deep cycle and duel purpose batteries. I understand your condition as i have been to those shoes before struggling to figure out which one would be the best. Choosing the best on your first try is bit of a challenge; specially without much experience or knowledge. But Why You Need To Replace Battery Now ? Winter is off and you are ready for your favorite fishing sport. While you take very good care of your boat, motor’s, external accessories and fishing gear; you don’t pay much attention to your boat battery. It’s normal, we all take our batteries for granted giving a look each season. But since they loose their charge over time even sitting idle; many loose their battery by the time we need them to get back in water. Even with no maintenance battery if we forget to give charge from time to time; they may end up dead. It’s no wonder now we need a new one to replace the old dead batteries. It’s normal and nothing to be embarrassed off; even i had to go though this trouble. So if you are looking for a new one we are here to help pick the best one for your needs. With in depth analysis and quick to refer features its a perfect gig to quickly research and make your call. Do not worry as i am gonna break the puzzle for you with in-depth explanation on their plus and minus; thus helping you get the best among all marine batteries. 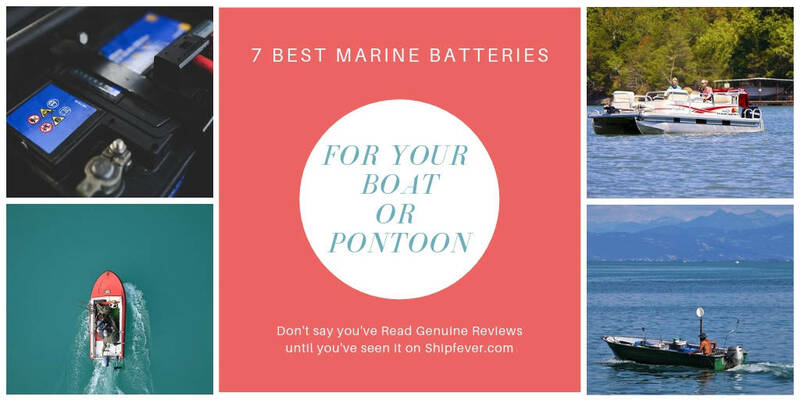 Just read the in-depth review of the my top picks for maritime batteries best for your boat or pontoon where i have discussed about features, its capacity, durability and weakness of individual product. Not just this have a look on the section explaining 101 battery basics with tips to prolong its life. There are three different types of batteries you can find on your pontoon or small boat. The first type is of cranking type which is connected to the starting mechanism of your power motor. They are also called as the primary marine batteries as without them you cannot start your boat motor. The second type are the ones which used to power accessories on board like fish finder, lights and other power requirements. Unlike cranking batteries which can hold sudden high amp load; these are best suited for constant long for prolonged use. The only other type that you may find are the dual purpose batteries; the one which serves the purpose of both. Cranking batteries while need a constant charge or float charge to be specific the deep cycle batteries can be discharged and recharged again without negative effects. It’s much like the one used in our cellphones and laptops which we can charge and discharge based on ease and availability of power. Many boats including kayak and pontoon also have more than one such batteries for the single purpose. For example a boat with 24 volt trolling motor may have two 12 volts cranking battery connected in series. There is a good chance that you replace only one of them with the new one; only to latter find it get drained and fail way before expected. This happens when you connect a old battery with a new one. The old battery then drag the new one to its limit to maintain equal amp rating; thus causing it to fail early. So it’s always wise to change complete set at a time rather than getting into a continues loop of replacing one battery at a time. If you want a battery that don’t need a look upon in next five to six years, this is the one you should go for. While optima as a brand is known for its edge in battery power technology and product quality; Optima 8006-006 34 M is best known for its on-boat of-boat application. It’s an excellent choice for your boats or pontoon. It’s not just more compact than regular lead acid battery but also produce move power and can hold charge for longer. The AGM technology of these batteries utilize spiral cell technology. This not just give freedom from all the trouble checking water level but also improves efficiency and performance. It’s an awesome replacement for your old marine batteries used for cranking power motor / starting engine. But an equally disappointment when used as a regular or deep cycle battery. So its better to know beforehand what the battery is to be used for. Believe me it’s a big disappointment; installing a best cranking battery and expecting results of an regular or deep cycle battery. While it sound novice and stupid it’s what happened with some of my friends. The Optima 8006-006 34 M is compact and durable with more than ten times higher resistance to vibrations and parasitic electrical drain. With that installed on boat you hardly need any backup battery. The boat can sit idle for weeks or even months and will start right up ! With 800 Amps Cold Crank Capacity it’s certainly much better than standard starting batteries. With that high Cold crank capacity it will give same cranking performance even in cold weather. Six to eight years of battery life. Brand satisfaction – Optima is a well know company in battery power. It’s relatively heavier than others. Don’t work That well when used as a multi-purpose battery. Is relatively costlier than few economical options. Not a 100 % specific to Boats or marine application ( Can be used in RV’s ). If You Like to check out more about the Optima 8006-006 34 M battery and genuine user reviews; you can Find it Over Here on Amazon. If you are on a constrained budget and does not expect more from a battery than to provide power for reasonable time; this is the one you should go for. The mighty max Light ML35-12 SLA Batteries came with 12V 55 amps power supply. Being sealed lead acid battery its maintenance free; which means no watering or need to check levels. Being known for its long service life at wide operating temperatures the best part is its compact and light. Which means you don’t need to carry those 120 ft 50 lb battery at water. Even i personally had used it not because its cheap but its the best at the price range. The battery is shock proof and can be mounted or installed in any way possible. Just place it, plug and then start ! It’s that simple provided you don’t have issues with its relatively small size. The Light ML35-12 SLA Batteries is best fit for your small boating need like with trolling motor in kayak and thrust motors in minn kota. The battery itself is so powerful that when fully charged it can last between two and three hours even when you go at max speed. With one year warranty there is no reason not to buy this for your small boat. But probably you have one; being a sealed lead acid battery you can’t do much when your level starts to drop after 3 to 4 years. High performance for wide range of operating temperature. Best for small boats and kayaks. You can’t do much when your water level starts to drop after 3 to 4 years. May not fit tight with your old standard battery holding case. You can check on Light ML35-12 SLA Batteries current price and more on the link over here to Amazon. Being a deep cycle battery unlike regular cranking batteries; these can be used to both start and run engine for hours. While they can be used on any boat but are best match for trailing motors. With these batteries you don’t need to constantly connect with your power; and can work just fine even when deeply discharged over and over again. The optima brand itself is the guaranty of quality over the past years as their battery hardly fails and even when they do its been taken care of by their customer service support. With 12 volt output with 750 cold crank ampere its great for small fishing boats, pontoons and recreational activities. The pure lead design enable to bear shock loads and vibration increasing its overall life. While repetitive charging and discharging may reduce life of other starting battery; optima 8016-103 D34M can go up and down on charging with no negative effects. With an overnight charge it all set to work with full acceleration for next four hours with your stereo’s and other accessories on. It cannot go wrong with optima batteries no matter the load or the condition. Although its a bit more expensive with no maintenance requirement, long life and high power supply its worth to every penny. Good starting performance with 750 Amps of cold crank. One of the best 12 V battery available for marine application. No more worries to refill with acid. ( Maintenance Free ). Very Long life of 6 to 10 years if it outlast first 6 month. Two Year Warranty ( No Question Asked ). No negative impact on its life due to repetitive “Complete charging and discharging operation“. Compact – It may not fit in your standard battery box. 4% of such battery fail in first 6 month due to manufacturing defects. If you like to checkout more reviews and technical specification of the optima 8016-103 D34M batteries; feel free to Find it Over Here on Amazon. If looking for a solid battery for your boat accessories and recreational purpose at reasonable price there is no match for this battery. While the product is made in china but performs reasonably better than other batteries at this price. The 12 V Universal UB121000 battery has a power capacity of 100 amps per hour. The battery itself is spill proof which means even being a lead acid battery you don’t need to monitor levels or water it. It’s a stellar product for the price which is both reliable and easy to install and position. But since it can take load of most power requirement on boat; it doesn’t mean it can be used to start or crank your boat engine. The battery is a true deep cycle type with solid backup for longer period of time. It can run a 200 watt appliance for more than ten hours with a reasonable decrease of 20% charge capacity. With this you can run your trailing motor and other appliance without worrying ever of deeply discharged. The battery can pick up charge even after siting idle discharged for weeks. So if you had this problem to forget charging on time it’s really a life saver. Moreover unlike high cost solution which are sensitive to over charging; its simply not. With this battery while you never get in trouble but even when you did the company allow for quick replacement – no question asked for a warranty period of one year. Take charge even kept discharged for weeks. No Known issue to ignore other than “Made in China”. Want to know more about Universal UB121000 battery then hover the link to it Over Here on Amazon. In generally while its better to install two separate batteries on boat;one for cranking and the other deep cycle. But for many boats there is a constrain in space; so only one battery can be installed. This is where the Yellow Top – Optima true dual purpose battery become significant. While most dual purpose batteries can’t start boat engine with the same capacity; the yellow top optima 8040-218 D35 batteries simply can with ease. If you want something which not only take care of your engine needs but also handle other power needs; you should go for the yellow top. While other’s batteries may loose to take charge after repetitive complete drain. Optima yellow top batteries with gel technology simply won’t suffer that much as other standard batteries. With five to eight years of battery life ( If it don’t fail in first four to six month ); 12 V supply with 650 cranking ampere and 98 minutes reverse capacity under constant performance there is no other match for duel purpose marine batteries. Furthermore the state of the art design protect it from impact and vibrations; one of the leading reasons for battery failure. Three Years Guaranteed replacement warranty. Overcharging for too long may kill this battery. Almost 5 % of this battery don’t last till expected six year of service life. If you like to check out more on optima 8040-218 D35 battery regarding its technical specification with more reviews; Checkout From Link Over Here on Amazon. If you don’t like somewhat fancy and look for old school but stellar; the Banshee D27M 8027-127 batteries are a good fit for your marine needs. It is a 12 V battery with 77 amps per hour power capacity with reverse capacity of 114 minutes. This means the battery gives two times more power than any other battery at even lower price. This is all possible due to its larger size ( adding more number of plates ) and large surface area of plates providing more charge to store / discharge. It’s basically the second generation of basic lead acid battery with no requirement to add water in its life time. But that also makes it impossible to compensate for any water loss. With 800 amps cold crank capacity there is no doubt this battery can be used to crank your boat motor with ease. And since its a deep cycle battery you does not need to permanently connect it to power. The battery can undergo more than 400 discharge and charge cycle with no negative impact on its life. While it seems to be best for your starting, lightning and other power needs; it too have few problem. The battery is large and bulky and so need extra effort to carry and install on board. With no design protection against vibration and shock impact it’s required a little extra care in the long run. Can be used for both constant power supply or cranking purposes. More than 400 active discharge cycles. One year replacement guaranty with two years warranty. Best for both marine and non marine application. Cannot replenish water if lost. Checkout Its Current price On Amazon from Link Over Here. What will you think if i would have to say Vmaxtanks V35-857 battery is one of the best for your boat, pontoon and trolling motor. If to be told the truth its the only battery which is affordable, work best, durable and specific to marine application. While other battery are best in some filed and not so good in others; its just good in all of them. So what you get is a 12 V high capacity battery which you can use to run your 45 lb trolling motor for hours without much impact in trust. You won’t even need to recharge it before 12 next hour’s. While it match up to 90% of optima batteries in performance it outpaces all in terms of total life. The state of the art AGM technology add to its physical and electrical capabilities. furthermore its compact, light weight, reliable and 100 % maintenance free. It’s stellar design helps protect it from negative effects of vibration and impact forces. If you are not doing just fine with your old battery and still not confident which way to go; its the choice you won’t have to regret for. The battery itself is deigned with heavy duty leads using AGM technology to work more and last long. Best for trolling motors on your recreational and fishing boats. High power in small size. Six to ten years of battery life. Longer hour of consistent thrust outcome. Very light and easy to handle. Honestly no reason to say no other than you already make up your mind to buy another battery. If you want to check more on the Vmaxtanks V35-857 battery here is the link to the user reviews and product page on Amazon Website. Many boater ( boat enthusiast ) don’t have to replace their marine batteries for the fix six years. But when they do need to replace their boat batteries; they often seems to find it a bit complicated. But in reality it’s a simple task even a 12 years old could do once know the basics; understanding what need to be done. Now the first thing of replacing old battery is to find its’ type; cranking / deep cycle or dual purpose. Once confirmed its time to buy a new battery compatible with the power requirement. Bring in wrenches / spanners of appropriate size to open the terminal connections. Start with the black wire representing negative terminal. In case you have any battery switch; put it to off condition before removing the terminals. Once you have successfully disconnected black ( Negative ) terminal; its time to do the same with positive ( Red ) terminal. Once both terminal disconnected clean the terminal convectors with clean cloth. Now using your gloves or bare hand lift the battery out of the battery box or case. Line up your new battery terminals to the associated cables; i.e black terminal to the side of black cable and right terminal on side to red cable. Now slowly put it into the battery box and reconnect cables starting with the positive ( Red ) cable on positive terminal. Now using the provided nut and bolt secure it tight using the spanner of appropriate size. Similarly connect the black cable to the negative terminal ensuring cables to be properly connected to battery terminals. Once set, put the battery switch to on position. Now your boat is all set to go on for smooth ride.